Tomatoes are one of the prime ingredients in our cooking. It helps to add rich texture and tangy taste to your dishes. But apart from making your recipes delicious it also helps to keep your skin healthy and brighter. Tomatoes are rich in vitamin c and contains natural bleaching properties. Hence it is also used in various skin care remedies and skin brightening products as an ingredient. It has an acidic nature similar to the lemon hence it is also used to reduce the acne as well. Tomatoes also help to reduce the dark spots and blemishes effectively. You can get these amazing benefits of tomatoes by using it as your face masks. 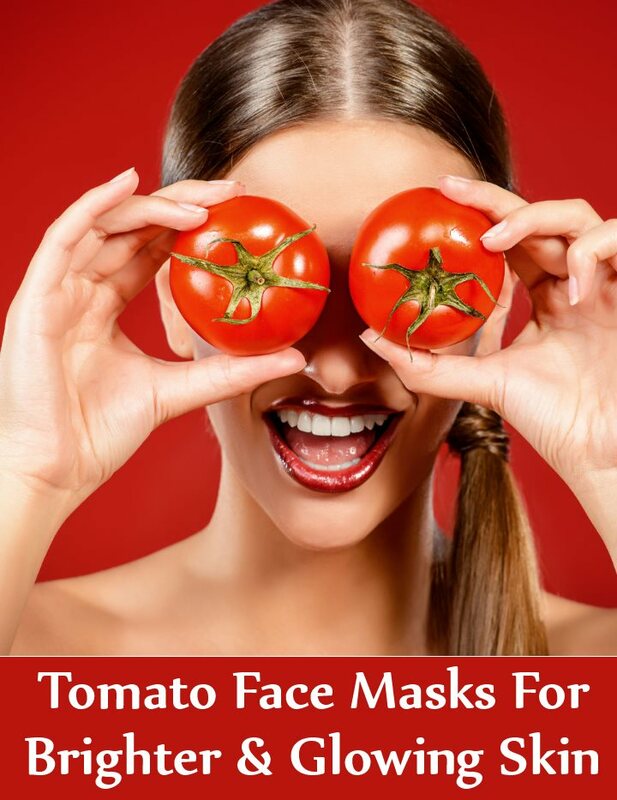 We would be discussing some easy recipes of tomato face masks which would help to address most of your skin concerns. Tomato belongs to the citrus family hence it contains natural astringent properties. These astringent properties help to control the excess oil secretion and keep your pores clean. With regular usage it also helps to shrink the pores to give you an oil free matte skin. To prepare this mask you would need one tablespoon of cucumber juice and one tablespoon of tomato juice. Mix it well and apply on your face with the help of a cotton ball. Let it sit for 15 to 20 minutes and wash off later with cold water. This mask would help you to control the greasiness of your effectively. Cucumber also contains natural astringent properties which help to keep your skin oil free. You can follow this mask thrice a week for best results. We already discussed above that Tomato contains natural skin bleaching properties which helps to lighten and brighten the skin.You would need one tablespoon of tomato juice, one teaspoon of sandalwood powder and few drops of lemon juice. Mix all the ingredients well to form a smooth paste. Apply it on your face and neck and let it sit for 20 minutes. Wash off later with cold water. Sandalwood powder and lemon also contains skin lightening properties which would help to give you a brighter complexion. You can use this mask twice a week for best results and it is suitable for all skin types. This facial mask is very beneficial to soothe the skin irritated by sun exposure and reduce the tan. You would need one tablespoon of tomato paste and two tablespoons of yogurt. Mix both the ingredients well and get a smooth paste. Now apply this mask on your face and the affected area. Keep it for 15 to 20 minutes and wash off later with cold water. This mask would helps to brighten the dull and tanned skin with regular usage. This mask is suitable for all skin types and can be used thrice in a day for best results. This is a very easy remedy to get an instant glow on your face. You would just need cut the tomato in two halves. Dip one half into the yogurt and sugar. Now rub this tomato half on your face gently in circular motion. Do it till the sugar granules melt. Once done let it sit for 5 minutes. Wash off your face with cold water. Pat dry and follow up with your regular moisturizer. You would be able to see an instant glow in the first usage it self. This mask can be used twice or thrice in a week for best results. Regular usage of this mask would help you to get rid of dark spots and blemishes as well. This facial mask helps to shrink the acne and reduce them. To prepare this mask you would need one tablespoon of tomato paste and one teaspoon of lemon juice. Mix it well and apply on your face. Let it sit for 15 to 20 minutes. Wash off later with cold water. You can follow this mask weekly to get best results.